I have just embarked on the epCop MOOC (ePortfolio Community of Practice Massive Open Online Course) and I like it! I started this blog to reflect on my MOOC travels. I’m starting to get my bearings around the wealth of resources this MOOC offers! Indeed, I find it very well structured and learner friendly 🙂 Kudos to the design team! Like many other participants, I’m afraid I won’t have enough time to absorb it all, but I’ll do my best ! I published some information about myself on the foliofor.me site. I used this site to play around with the new functionalities of mahara 1.4. I built my cat’s portfolio, trying to use most of the new features. I also built a profile page there (there’s an English and a French version for both pages). I attended the ePic11 conference in London recently and had the pleasure to meet great people. 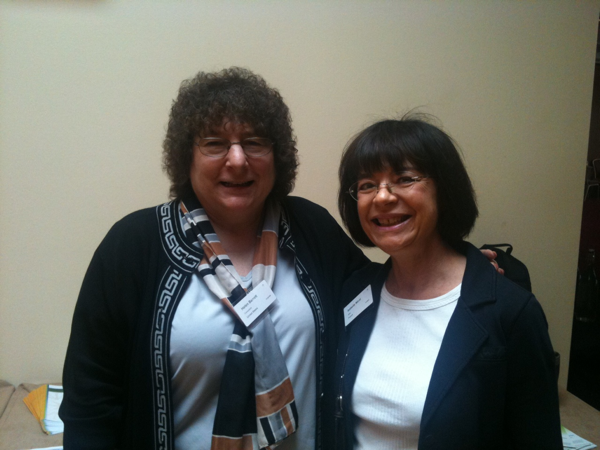 I was most honored when Dr Helen Barrett accepted to pose with me! I still have to organize my conference notes and share them! 3-dimensional learner (lifelong, lifewide, lifedeep), passionate about all things facilitating learning. This entry was posted in epCop and tagged Electronic portfolio, epCop, epic11, ePortfolio, MOOC. Bookmark the permalink.